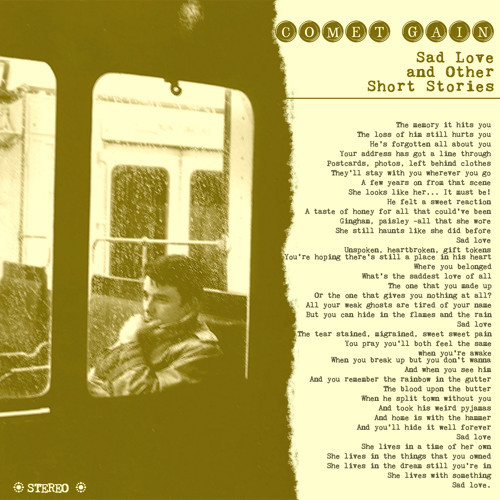 Comet Gain - "Sad Love" And Other Short Stories by Fortuna POP! Taken from the album Paperback Ghosts, Comet Gain’s new single “'Sad Love' and Other Short Stories” is a classic upbeat indiepop tune, brimming with melody and slathered in chiming Byrdsian guitars. Over yearning harmonies and keening strings songwriter David Feck muses on a love left behind and what might have been, on a life haunted by memories of unrequited romance. This song grow with every listen. Love it. This is where the chick singers go, no? Still going (strong). Like it! Love at first listen !